Can a Deep Cleaning in Natick Help You Keep Your Teeth? Absolutely! Gum disease affects 3 out of 4 Americans, which has serious consequences because it’s the leading cause of tooth loss. Many people take their teeth for granted – until they lose them! That’s why diagnosing and treating gum disease as early as possible is so incredibly important. 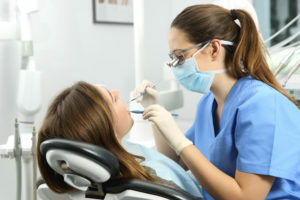 The first line of defense a dentist typically recommends is a procedure called a deep cleaning, which is particularly effective in the earlier stages of gum disease. In this blog, you’ll find out what a deep cleaning in Natick is, why you might need one and how it can help you hang onto your teeth as long as possible! What Is a Deep Cleaning and Why Would You Need One? Your gum health is the foundation of a healthy smile. Even if a tooth has never had a cavity, it can become loose and fall out if the surrounding gum tissue and underlying bone aren’t healthy enough to support it. When patients are told they need a deep cleaning, one of the first questions they (understandably) have is, “Why can’t I just get a normal cleaning?” A deep cleaning is necessary when the gums need extra care to be healthy – and a normal cleaning isn’t enough. Gum disease runs in your family – As with nearly any condition, gum disease can be inherited. Unfortunately, patients who have gum disease in the family often need to do a little extra work to keep their teeth and gums healthy, including taking excellent care of things at home and getting consistent professional care. It’s been a long time since your last cleaning – If it’s been a year or two (or more) since your last cleaning, it will probably require more time and effort to remove all the buildup from your teeth. You can think of it like this: If it’s been just 2 years since your last cleaning, your hygienist has to catch up on 4 cleanings at once (since cleanings are usually recommended twice a year). If it’s been 5 years, they have to catch up on 10 cleanings, and so on. You build up tartar quickly – Some people are simply predisposed towards getting a lot buildup. If they miss even one cleaning, a deep cleaning may be necessary to remove their excess tartar buildup. How Will a Deep Cleaning Benefit You? You’re probably familiar with the annual gum exams done during checkups, when your hygienist uses a tiny “ruler” with millimeter markings to measure the pockets around your teeth. Healthy gums have pockets of 1-3mm. Gum disease is indicated when patients have pockets of 4mm or deeper. When the pockets are this deep, even excellent brushing and flossing can’t reach under the gumline enough to remove the plaque, bacteria and tartar that build up there. A deep cleaning removes these deposits to improve gum disease. However, it requires more time and precision than regular cleanings. In addition, many people prefer to be numbed prior to getting a deep cleaning, which is why the procedure is usually done in two appointments – one appointment for the right side and a separate one for the left side. Deep cleanings do the work that you can’t do at home. They restore the health of your gum tissue, which is essential for supporting your teeth over the long-term. With early gum therapy in Natick, you can increase your chances of having a healthy smile for the rest of your life! After completing dental school, Dr. Medha Singh pursued advanced education in periodontology (the study of gum health). In addition to being regarded by her peers as an expert and leader in her field, she also provides outstanding gum care to her patients. If you have any further questions about how a deep cleaning can benefit you, she can be reached via her website or at (508) 545-1126. Comments Off on Can a Deep Cleaning in Natick Help You Keep Your Teeth? Absolutely!